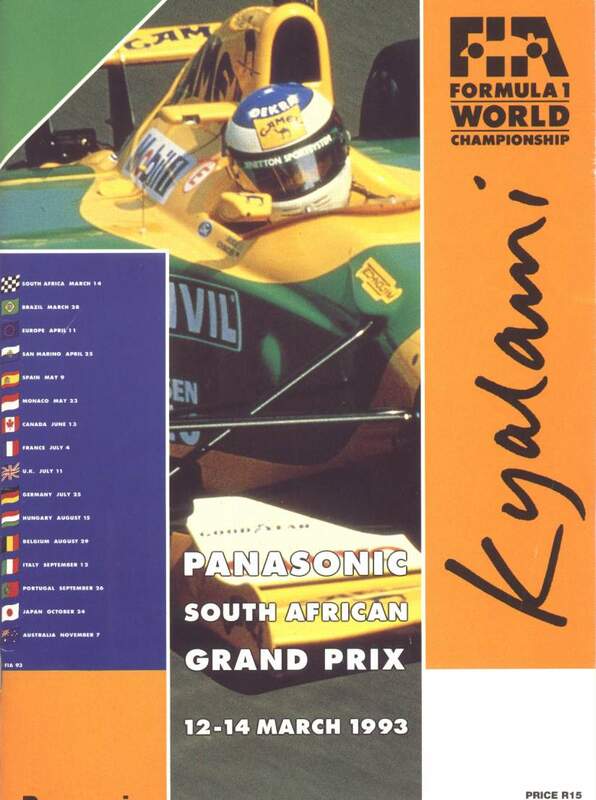 The 1993 South African Grand Prix was a Formula One motor race held at Kyalami on 14 March 1993. The race, contested over 72 laps, was the first race of the 1993 FIA Formula One World Championship and was won from pole position by Alain Prost, driving a Williams-Renault, with Ayrton Senna second in a McLaren-Ford and Mark Blundell third in a Ligier-Renault. This was the first time since 1971 that the first race of a season did not feature the defending Drivers' Champion in the field (in 1971, Jochen Rindt was missing as he was killed in 1970). Defending 1992 champion Nigel Mansell had moved to race in Indycar for the season. Since there was no defending Drivers' Champion in the field this season, defending Constructors' Champion Williams could not use No. 1 on either of its cars. Therefore, this was the first race since the 1973 United States Grand Prix that number 0 was used. The Swiss Sauber team made their Grand Prix debut and scored their first points with JJ Lehto's 5th place finish. ^ "Motor Racing Programme Covers: 1993". The Programme Covers Project. Retrieved 26 October 2017. ^ "1993 South African Grand Prix". formula1.com. Archived from the original on 2 December 2014. Retrieved 23 December 2015. ^ a b "South Africa 1993 - Championship • STATS F1". www.statsf1.com. Retrieved 20 March 2019.